WCRP: Children from poor families are more likely to face sexual abuse and labor exploitation, according to Daw Khine Khine Lei, Chair of the Mon State Parliament’s Women and Children’s Rights Committee (WCRC). Some of the most common reports received by the committee pertain to cases of sexual violence against children and child labor. 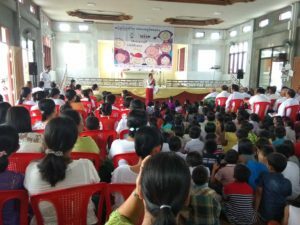 Her comments came during the ceremony for the 28th anniversary of the Convention on the Rights of the Child (CRC) held on November 19th 2017 in Pa Ouk village, Mawlamyine Township, Mon State. According to the data collected by MWCUC, Daw Khin Than Htwe estimates approximately 60% of children in Mon State are forced to drop out of school due to livelihood issues. In June 2015, The Woman and Child Rights Project (WCRP), a Human Rights Foundation of Monland (HURFOM) initiative, published “Inaccessible and Under-resourced: Concerns over education in rural Mon communities.” The report draws on interviews with 146 individuals in 17 predominantly Mon villages in Ye, Kyar Inn Seik Kyi, and Yebyu to present an exploration of education challenges in rural Mon areas. The report found that education largely remains inaccessible for children from poor families and that schools are chronically under-resourced. In addition, the report found that over a third of children were forced to drop out of school as they needed to work in order to supplement their family’s income. “There are 280 children who need to attend the school but only 235 join the school and the others have to help their family for their livelihood and can’t attend the school,” said a teacher from east Wai Thar Lee village, Kyar Inn Seik Kyi Township, Karen State. “For problems happening to children, the children’s courts are supported by the Child Law in order to properly solve children’s issues. Case Myanmar has already been established to document children’s issues,” said Daw Khine Khine Lei. Currently, there are four Case Myanmar staff from the Mon State Social Welfare Office that are active in Mawlamyine and Thanbyuzayat townships. Their goal is to conduct surveys in Mon State’s ten townships and report on children’s issues.